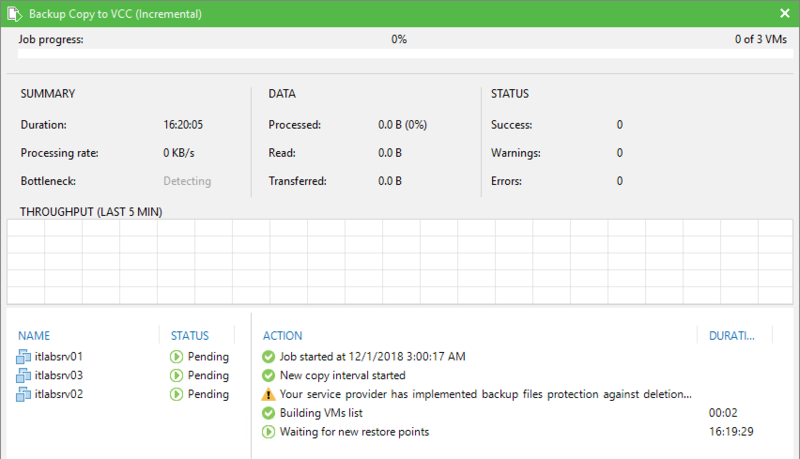 Insider Threat Protection is an additional protection mechanism for Veeam Cloud Connect backups, able to guarantee the safety of backups stored in Cloud Connect against mis-deletions or attacks against the tenant&apos;s Veeam environment where remote data stored into Veeam Cloud Connect are deleted on purpose, for example during Ransomware attacks to prevent the victim to avoid paying the ransom by restoring data from a backup. In this case, Veeam Cloud Connect cannot distinguish a legitimate user from an attacker; what it&apos;s seen is an account with the correct credentials requesting a deletion. And in this case, Cloud Connect obeys to the command. 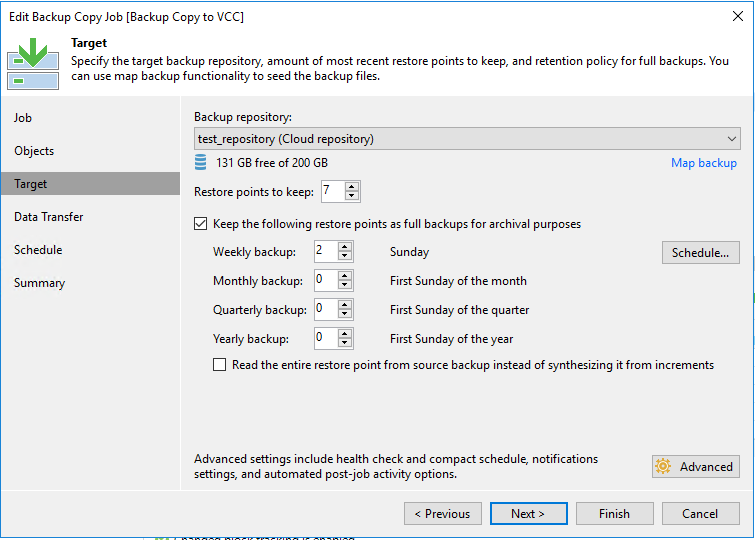 As you may notice in this screenshot, the recycle bin contains only incremental files, and this is due to the type of backup or backup copy job that has been sent to Cloud Connect. ITP "just" saves in the bin any file that is deleted on purpose or by the configured job retention. But in order to have a successful restore, a full file has to be available to properly initiate the backup chain. For this reason, tenants need to configure their backup jobs to have periodic full files in the bin, otherwise an attack will still be successful. You can immediately visualize where the problem lies. 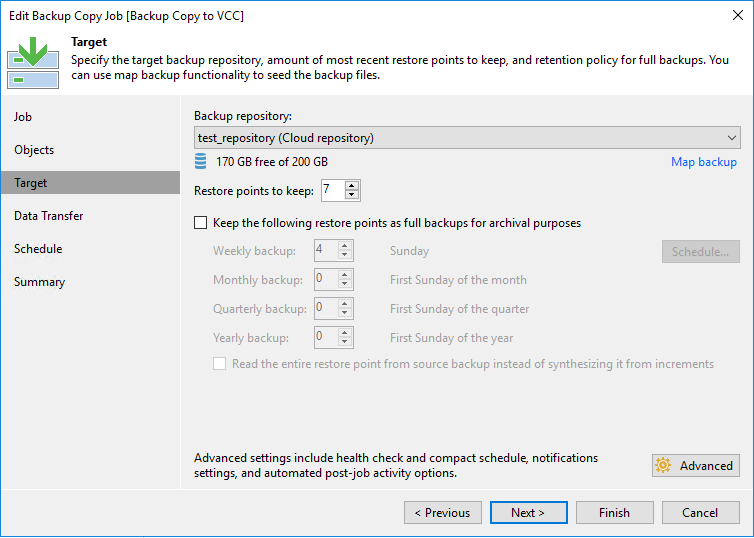 A primary backup job with Forever Forward incremental or a regular Backup Copy job will only have one full backup, that will always be updated by merging old incrementals. For this reason this file will never be placed in the Recycle Bin and thus, in case of a complete deletion of all the files in the Cloud Repository, there will be no full file in the Recycle Bin. For this reason, in order to make the Recycle Bin really effective, tenants need to use a backup mode that will periodically create Full files that will be "sealed", that is not touched anymore once created. This will allow them to age, be deleted by job retention and thus placed in the Recycle Bin where they will be ultimately protected. The complete text says: "Your service provider has implemented backup files protection against deletion by an insider for this cloud repository. To protect against advanced attack vectors, we recommend that you configure your cloud backup jobs to keep multiple full backups on disk (as opposed to forever-incremental chain with a single full backup)." Even if the entire Cloud repository is deleted, the service provider has now one consistent backup file to help his tenant to restore his data. You may have noticed in the picture 3.25 that the .vbk file stored in the Recycle Bin has a really small size. Instead of being some GB like its siblings stored in the production area, its size is just a few MB. And even if the file name states that it has been created on 2018-12-03, the last modified date is 2018-12-14. This is because the SOBR group where the backups are stored also has Capacity Tier enabled, as explain in chapter 2.8. This creates an interesting and powerful interaction between the two features, that we will explore in this section using a real example. Our Repository is built using a Performance Tier and a Capacity Tier. The tiering option is configured to move data to the Capacity Tier after 15 days. Then, the service provider configures Insider Threat Protection for the tenant for 60 days of protection. 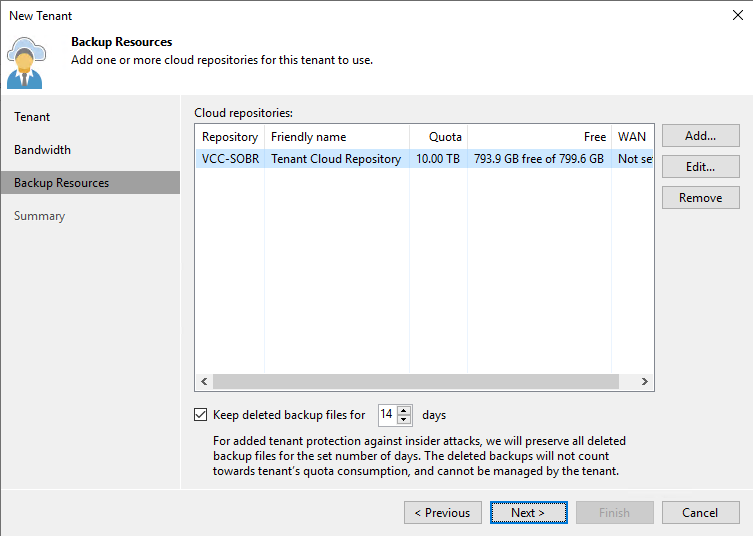 Finally, a backup copy job with GFS retention is created by the tenant, and it is configured as in picture 3.24. At day 21, a new weekly full will be created, and because the GFS configuration is set to hold 2 weekly full, the oldest VBK file will be deleted by the job. This file however is only 21 days old, so it will be intercepted by Insider Threat Protection and hold for other 39 days. But what is exactly intercepted and moved? The file that will be moved is only the dehydrated VBK file, while the blocks tiered to the Capacity tier belonging to it will stay in place. In this way, no download will happen from the Capacity tier to SOBR, and this is especially helpful when the Capacity Tier is built using public cloud services that bill for downloads. Once the retention is reached also for the Insider Threat Protection, finally the dehydrated VBK file is deleted, and if the blocks stored in the Capacity tier are not belonging to any dehydrated file, they will be deleted too. TIP: in order to use the Capacity Tier as the designated Recycle Bin, providers should configure the option in SOBR in order to have Capacity Tier always kicking in before the job retention. In chapter 7.1 we will discuss how service providers can restore data from Insider Threat Protection, both locally and from the Capacity Tier.